The fourth Jour Fixe will take place on Monday April 29th at 5:30 p.m. in room 22 (HU Berlin, Spandauer Str. 1). The Jour Fixe offers a great opportunity for informal exchange between lectures and students. Especially regarding the introduction of new specialization areas such as “Data Science” and general feedback about the courses and the structure of the master program. This entry was posted in News on 4. April 2019 by admin. This entry was posted in News on 4. March 2019 by admin. Traning courses during the semester break are offered by FU:stat. The courses are concerned with programming (R, SPSS) and hypothesis testing and more. 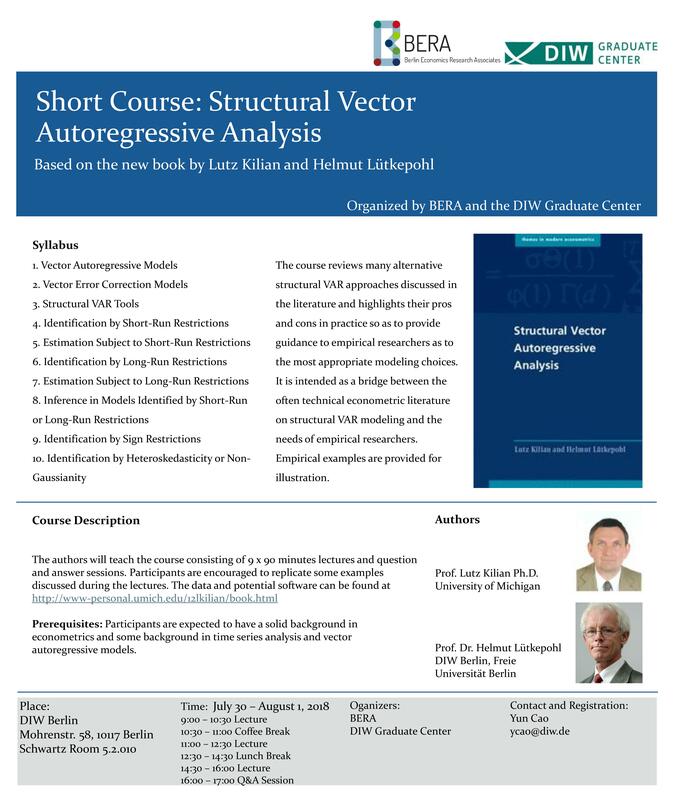 The complete course list with additional information can be found here. This entry was posted in News on 5. February 2019 by admin. This entry was posted in News on 9. October 2018 by admin. 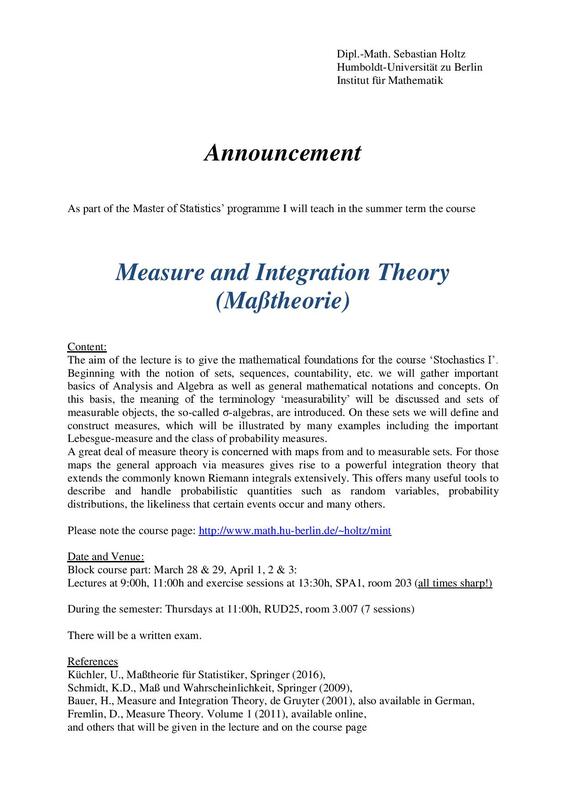 Prof. Dr. Nadja Klein is offering a master thesis topics at the Chair of Statistics. Suggestion of own topics in the areas of Bayesian Statistics, Computational Methods, applications on distributional regression or Machine Learning are welcome. This entry was posted in News on 1. October 2018 by admin. Open day presentation of the Graduate School of Economic and Social Sciences (GESS) of University of Mannheim at Oct 26 2018. If you plan on beginning a PhD the open day is a great opportunity to inform yourself about the possibilities at GESS. To register for the Open Day, send an email to gess-openday@gess.uni-mannheim.de no later than August 15, 2018. This entry was posted in News on 27. June 2018 by admin. This entry was posted in News on 17. June 2018 by admin. The third Jour Fixe will take place on Wednesday May 16th at 5 p.m. in room H1028 (TU Berlin). The Jour Fixe offers a great opportunity for an informal exchange between lectures and students. Especially regarding the introduction of new specialization areas such as “Data Science” and general feedback about the courses and the structure of the master program. Afterwards, at around 6 p.m., Rémy Slama (INSERM and Institute for Advanced Biosciences, Grenoble) will give a talk with the title Characterizing the effect of multiple environmental exposures on health: methodological challenges, and first results of Helix early-life Exposome project. Note that the date has changed from May 14th to May 16th! This entry was posted in News on 5. May 2018 by admin. please send an informal mail to michael.lebacher@stat.uni-muenchen.de. 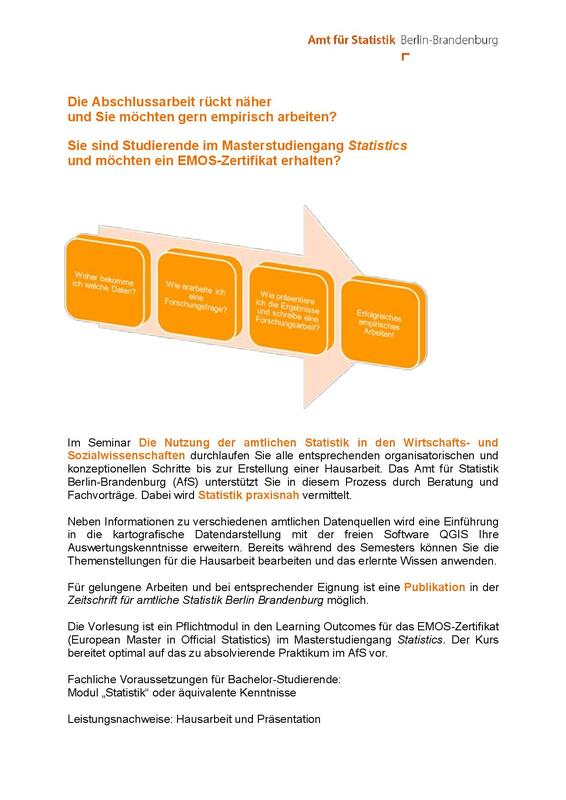 For more information online see http://www.en.wisostat.statistik.uni-muenchen.de/workshop. This entry was posted in News on 19. April 2018 by admin.